Is a non-flush toilet of an expression. Does not choose the location because it does not require a water supply works and sewerage facilities. The image is a type of temporary toilet is strong, and installation is simple and inexpensive that will be more attractive than a simple washing formula. Simple expressions and expressions in the toilet flush water washing, but it is necessary to periodically check and maintenance of water flow mechanism, in the case of non-rinsing formula will be checked and the only tank pumping arrangements take flight. For this reason, available efficiently in parks that are managed in small groups. In the short-term events such as the venue that can not, such as fireworks, starfish will take a long preparation period, many of temporary toilet flush non-expression of maintenance and operation check has been useful. 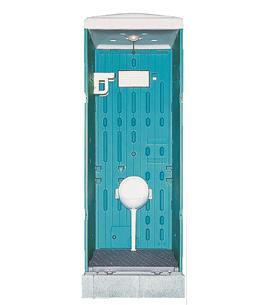 Because it is easy to get, you can use it as a disaster such as a toilet for the assembly structure is also simple.